We live on a British military base currently and about every other week I make the hour drive to the closest American military base to check our mail there as well as hit the commissary to stock up on American foods I can’t find in the stores here. I went last Friday and when I got back to our house and opened the trunk of my ancient Land Rover one of the bags fell out. Luckily nothing broke but just as I was picking the bag up I heard a “pop” sound and looked down to see my package of crescent rolls popped open! 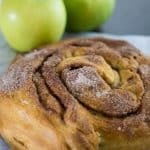 Never one to let food go to waste I used them to make this Apple Cinnamon Roll and it’s going to be my new favorite fall dessert! You can see from these pictures that my dough was not looking so hot after it’s unfortunate fall. I laid the dough out on a baking dish and sealed the seams as best I could by pinching them together. 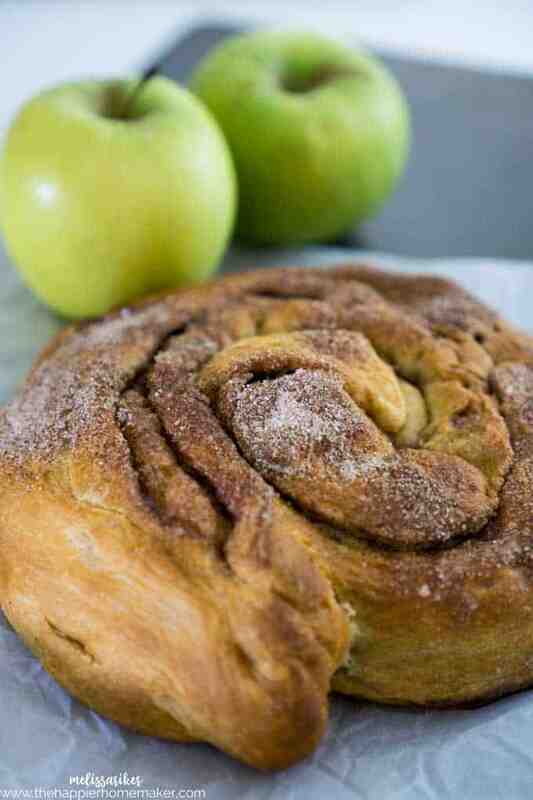 Then I sprinkled a finely diced apple over the dough and topped with a cinnamon sugar mixture. I carefully rolled up the dough and then coiled it into a spiral. Then it was just a matter of popping it in the oven and trying to be patient! The results were fantastic and I love how quickly and easily it all came together. This would be a great to serve for breakfast or a coffee group! Preheat oven to 350 degrees. Roll crescent dough out onto a baking sheet and use fingers to pinch together the seams. Spread chopped apple over the dough. Mix cinnamon and sugar and sprinkle over apples. Carefully roll the long side of the dough to form a cylinder. Arrange the dough into a spiral shape and bake for 18 minutes or until golden brown and dough at center is fully cooked. Serve warm. 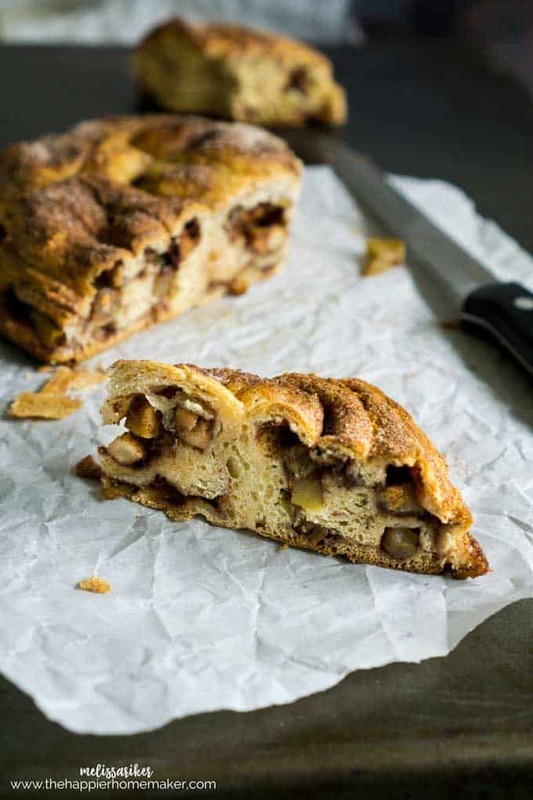 Four ingredients and 5 minutes prep time make this Apple Cinnamon Roll the easiest dessert ever! 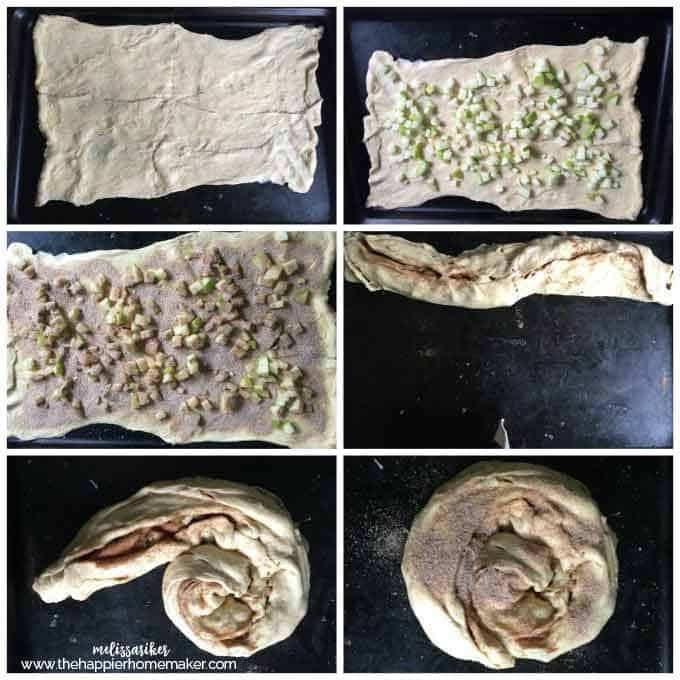 Roll crescent dough out onto a baking sheet and use fingers to pinch together the seams. Spread chopped apple over the dough. Mix cinnamon and sugar and sprinkle over apples. Carefully roll the long side of the dough to form a cylinder. Arrange the dough into a spiral shape and bake for 18 minutes or until golden brown and dough at center is fully cooked. I bet this would be awesome with some “on hand” walnuts or pecans ! I’m definitely going to try this for a quick dessert. Love incorporating healthy fruit into desserts! Yum Yum! I’m going to try these soon!